A hundred and fifty metres from the Countess Wear Bridge, these parallel swing and bascule bridges take the A379 across the Exeter Canal. They are operated from a control room that looks similar to a bridge on a ship. They are designed to be opened to allow shipping to pass up and down the canal. Rarely raised nor swung now, because no commercial shipping uses the canal and tall yachts cannot pass under the M5 road bridge a little down stream. The bridges may not often open for water bourne traffic, but they are kept busy with 36,000 vehicles a day passing over them along the A379. The canal has had a series of swing bridges prior to this one, including two by James Green, the County Surveyor in 1821 and 1831. Although the City Council was responsible for the bridge, the Exeter Turnpike Trust who were responsible for the roadway leading to the bridge would make representations to the City Surveyor. In 1878, the Turnpike Trust contacted the Surveyor as they claimed the bridge "... was very shaky, and many horses did not care about going over it." This approach seems to have prompted the Navigation Committee to recommend in June that the old cast-iron swing bridge be removed and a new light, wrought-iron, bridge be built. 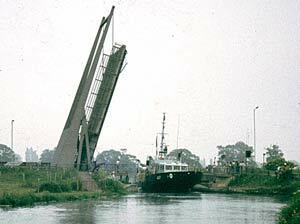 As the old bridge was clumsy, badly balanced and difficult to move, it was decided that the new bridge be fitted with a hydraulic mechanism, using water from the canal to swing the bridge. The low level of the land on each side of the bridge, and the low height of the bridge gave some concern to a columnist in the Flying Post in 1892 when he complained that flooding often blocked the road and maybe the Council should raise the bridge and the road between Countess Wear Bridge and the swing bridge. This comment was made as the result of a Council meeting in which they decided they would not contribute towards the cost of raising the bridge. The next year, the same columnist wrote that the Council were working to raise the headroom of the bridge – the headroom for boating was only 3ft 8 inches, and he hoped that not only would "... cracked craniums or dislocated vertebrae" be avoided in the future for pleasure boating, but that operating the bridge would be easier. 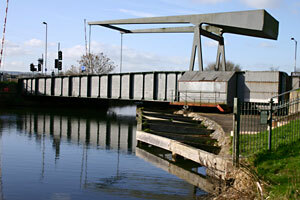 The modern swing bridge dates from 1936, replacing an 8ft (2.5 metre) wide bridge, and is an early example of a steel plate riveted girder bridge. It was constructed as part of the £230,000 scheme to build the 5 mile long Exeter by-pass from Pinhoe to Peamore. The earlier bridge had very steep approaches on each side, and was not able to carry a large load. The new bridge was tested with 10 heavy steam rollers weighing all together, 120 tons; the engineers measured a downwards deflection of the bridge roadway of 0.205 inches (0.5 cm). The City Surveyor reported to the Navigation Committee of the City Council in September 1952 that at approximately 1.30 pm on the 13th August, while the Ben Johnson, carrying oil for the basin, waited for the bridge to open, the main driving shaft on the bridge snapped and dropped, jamming the mechanism, with the bridge partially open. Cars nor ships could pass the bridge as a mobile crane was used to lift out the damaged parts. Messrs Marcus Hodges & Sons Ltd were asked to turn a suitable replacement shaft from a block of steel. Meanwhile, the Ben Johnson's ship's gear was used to pull open the bridge from the bows, and after passing through, the vessel closed the bridge behind it by pulling with a rope. By 6pm traffic was crossing the bridge. For the next two days winches and tractors were used to open and close the bridge. By 7am on the Saturday 16th August the replacement part had been fitted and the bridge resumed normal operation. The northern bascule bridge was built in 1972, parallel to the swing bridge. It was built by a Sheffield company who used aluminium for part of the structure, to reduce weight. The lifting section is 17.28m long with a carriageway width of 6.7m and a footway on the outside edge of the parapet of 2m. Major remedial work has been carried out on the two bridges from September 2006 to May 2007 causing long traffic delays in a contraflow system. The bascule bridge was covered for many weeks to allow repair work to take place in the dry. "In May 1944, these bridges played an important part in the preparations for D-Day. They were used over a period of three days and nights, for rehearsals of the famous and crucial glider borne attack on the bridge over the Canal de Caen (Pegasus Bridge) and the River Orne (Horsa Bridge), by the Second Battalion Oxfordshire and Buckinghamshire Light Infantry, on the night 5/6 June 1944." The plaque was unveiled on 20th July 1994 by Colonel D J Wood, M.B.E., late Oxf Bucks, President, 87 Exeter Branch Normandy Veterans Association. Source: The Times, Flying Post, City Council Navigation Committee minutes an other unlogged references. © 2005 David Cornforth - not to be used without permission. The 1936 swing bridge is in the foreground. 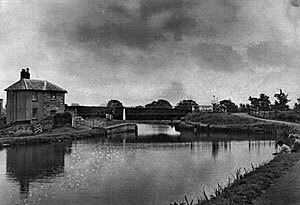 The swing bridge and bridge keepers house in 1961. The bascule bridge was added in 1972. Photo courtesy Express and Echo. The ASRL Stirling passes the bascule and swing bridge for the basin. Photo Alan H Mazonowicz.